Help us help more people! Do you like bikes? Do you like working on bikes? Want to help us? Awesome! 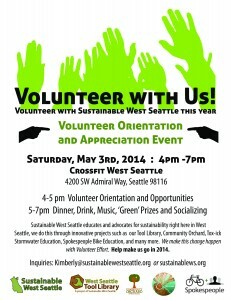 Our parent organization (Sustainable West Seattle) is having a volunteer orientation and appreciation event on Saturday, May 3rd 2014 at CrossFit West Seattle (4200 SW Admiral Way). Orientation for new volunteers will be from 4:00 PM – 5:00 PM, with an appreciation party from 5:00 PM – 7:00 PM. Please come if you have any interest in helping DIY Bikes, or any of the many Sustainable West Seattle projects. Thanks, and we hope you’ll consider helping us!